The madness on Innistrad has come to a head. Jace and Tamiyo witnessed Sorin's confrontation with Avacyn, and then they watched as the vampire destroyed the angel. 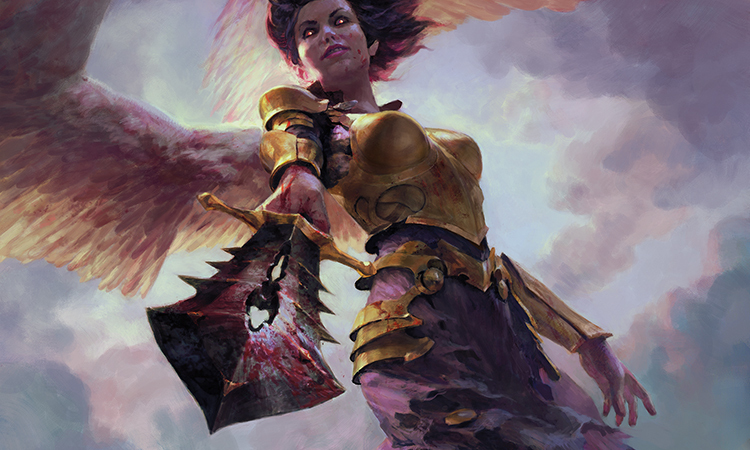 All of Innistrad shuddered when Avacyn drew her last breath. Now the plane is without a protector, exposed to threats both of the world and from beyond—exactly as Nahiri wants it. Rumblings can be felt across the land, and tremors shake the few hearts that have held out against the madness. Nahiri had done a great deal of work. She had kept her vow, the one she made when standing in the dust of Bala Ged. There was still dust under her fingernails and in the deepest folds of her clothes; she had left it there as a reminder. 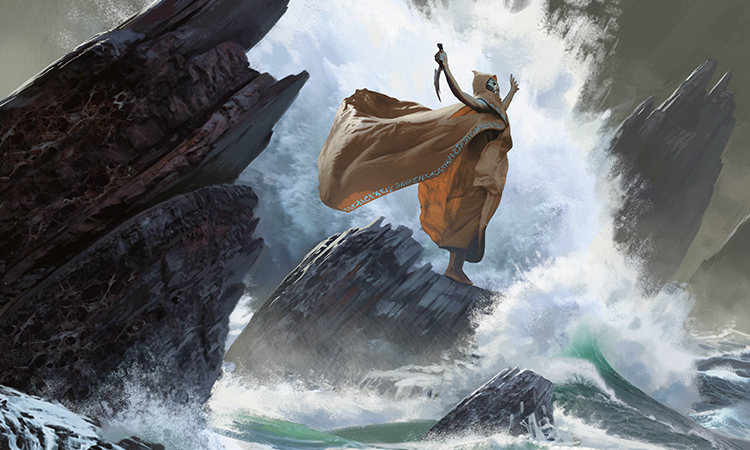 Since leaving Zendikar, she had pushed herself, every hour of every day and long into each night, allowing her rage to fuel her. She had strained, reaching out into the Blind Eternities with fingertips that burned from the swelling aether, toiling in stone, in magics more powerful than she had ever dared to wield before, and all of it had been ten times more difficult than she remembered. But she had not once complained, not once faltered or paused to rest. And now, finally, she would be rewarded. She would see her work pay off. And so, too, would Sorin. Innistrad's final ward had fallen. Nahiri had felt the lifting of the last shred of protection like heavy plated armor removed from a soldier after battle. The world was left naked and vulnerable. Only this time the battle was not over. It had just begun. 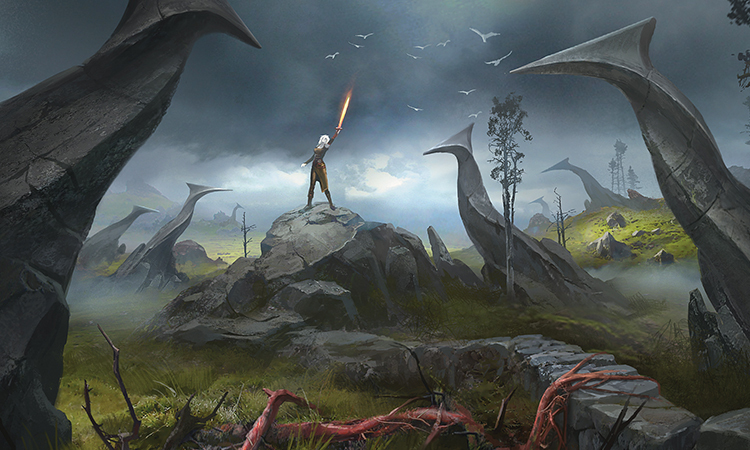 "As Zendikar has bled, so will Innistrad." Nahiri held her breath. The ground beneath her feet shifted. The plane began to pulse, seizing with tremors, like a chain of explosive reactions thudding deep under the surface and echoing through the night. Sorin would feel them too. This thought gave Nahiri great satisfaction. "Come!" she cried to the sky. "Come to me. Come to Innistrad!" She felt it then: a presence. The air became hot and still, and Nahiri breathed in deeply. Yes. She knew that scent all too well. A thrill flooded her with an intensity she hadn't felt in centuries. She ran to the edge of the bluff, her legs wheeling out of control, her mind unable to keep up with the hammering of her heart, the pounding of her feet. She looked to the water. To the temple she had constructed for the god. It was no longer empty. Tears blossomed in the corners of Nahiri 's eyes, but she swiped them away. This was not her moment to cry. "As I have wept, so will Sorin." The shape under the water grew, waves churned, and the surface threatened to break. Finally. It was time. It was time. Time to pray. Dear Archangel Avacyn. Mother told me that if I get scared, I should pray. I'm scared now. Though flanked by cathars with gleaming blades and hard steel armor, Maeli cowered. He felt alone. He had felt alone since he had fled the village on the day that the horrible angels had come with their rain of fire. He had run into the forest like his mother had told him, and he had not gone back to the village. He had wanted to a hundred times. But she had told him no matter what he couldn't return, and her eyes had been more serious than he had ever seen them. He had thought it best to listen. Now he wished he hadn't. Now he wished he was home. He clutched the stuffed rabbit given to him by the old woman with the gray hair. The one who had found him in the woods and taken him into her house that smelled of sweets and stale bread. She had told him to call her Ms. Sadie, and said that her house could be his house for as long as he wanted. But that had never been what he wanted. Dear Archangel Avacyn. I want to go home. Please. Can I go home? There was no answer. Instead, thick writhing arms reached for him, shooting through the space between the cathars' blades; they were the same writhing arms that had burst out of Ms. Sadie's chest that very night while they ate their dinner. It had happened not long after Maeli had felt his chair shudder, and even a shorter time after a gust of wind had blown through the open shutters, bringing along a smell like too-sweet nectar. His spoon had been in his mouth when Ms. Sadie's chest had cracked open; he had been halfway through swallowing a mouthful of thin stew. Most of the stew had come out of his nose, and it had burned him, inside his head, up behind his eyes. It had made him cry. Tears had streamed down his cheeks as Ms. Sadie and her too many arms chased him. "Stay back!" The cathars shifted in the tall grass, slicing off one arm after another. One landed at Maeli's feet. As he looked down at it, his insides twisted and squirmed; this was one of her true arms, he was sure. There was a bit of the yellow blouse she had been wearing, and farther down, her big brown, hairy mole blinked up at him. Maeli buried his head in the stuffed rabbit as a tear ran down his cheek. Please, Avacyn. The angel had come to him once before. She had helped him. When he was scared and lost. His mother had told him that Avacyn had come because she had prayed for the angel's help, prayed so hard that Avacyn could not ignore her. Maeli didn't know how one prayer could be harder than another prayer; he didn't know how to make his prayer so hard that Avacyn couldn't ignore it, but he knew he had to try. He screamed his prayer as loud as he could into the damp, matted fur of the stuffed rabbit. "PLEASE, AVACYN! HELP ME!" "Avacyn is gone!" The voice pierced the cold pit in Maeli's stomach, and icy fear leaked out, seeping up his spine and the back of his neck. Like cold fingers, it reached up under his skull, grabbing hold of his head and turning his eyes up to the sky. For a fleeting moment, hope pulsed in Maeli's heart. Hope that was a lie, he knew even as he felt it; the angel hovering above was not Avacyn. "She is here now," the angel said, looking straight into Maeli's eyes. "She is rising! Rising!" The angel tossed her head back and cried out with a shrieking laugh that filled the sky. Then abruptly she ceased laughing and held completely still as though frozen in the sky. "I—I'amrakul!" She dove down, her blade slicing through the air ahead of her. Maeli squeezed his eyes shut. Please. Please. Please choose me. Edith clenched her toes hard against the smooth, wet rock, securing her foothold. She was as close as she could get now. As close as she could be until the rising, until the becoming. Yet she wanted to be closer. Please choose me. She had proven that she was devout. The most devout. "The most devout." Choose me. She stole a hasty glance first out from under one side of her hood and then the other. Yes. She confirmed that the rocks nearest her were devoid of other cultists. She stood taller. Proud. No one else was there, where she was. No one else was as close. She was the closest. "The closest." She wanted to be closer. "Choose me! Me! Me'mrakul." She raised her arms, spreading them to the sky, opening herself to the one that was coming. The waves crashed over her. She could feel it; it was time. "Emrakul!" The name, the power, the fullness unfurled within her as the water roiled. "Emrakul!" The wholeness embraced her, entwined with her, became her. The sea swelled upward toward the sky. "Choose me, Emrakul. Take me. 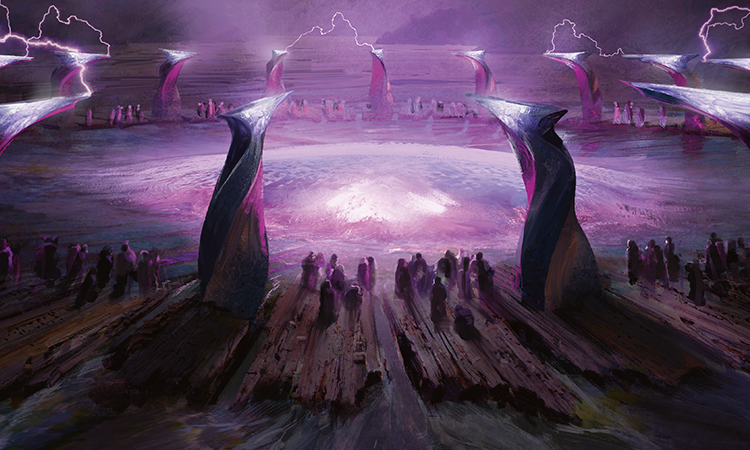 Emrakul." Other voices rose up behind her, chanting along with her, in time with the magenta glow pulsing beneath the surface of the water. "Choose me'mrakul. Take me'mrakul. I'amrakul." The glow grew stronger, brighter, more powerful, and it became a steady unwavering light. Edith inched closer on her rock, her toes searching for purchase. She was foremost. The closest. Closer now. Even closer. Around her, the great twisted stone pillars sparked in the night. Violet bolts of power discharged from the pointed edges, jumping from one to its neighbor and then to the next. Her power. It was all Her power. Everything was Her. Closer. Closer. The swell of the water sent waves crashing and rebounding. There was no longer a distinction between the sea and the land. Edith moved closer. Never before had she been the most. The best. Never before. But never before had it mattered. It mattered now, and she was now. The most. The closest. The best. "I'amrakul!" An explosive burst of sea shot up into the sky, rising like a thick column of stone, tumbling over itself, crumbling and growing simultaneously, chaos in motion. And then it froze, as though time had stopped. It hung there like a rocky mountain bluff in the sky. From below, there was a rumbling. Edith could not contain the wail that erupted from her chest. The sound of her voice swelled with the undulation of Her power, and melded with the resonance of Her embrace, complete. Emrakul saw Edith there before her. She looked down at Edith with one enormous, glowing magenta eye. And Edith saw Emrakul. She stared, transfixed, into the glow, falling deeper and deeper into the intensity of Her being. There was so much to see, so much to become. She had been chosen. "I'amrakul." She leaned in closer, pressing her back against Alena's. They were back to back and surrounded; Hal felt the urge to surrender, to crumple to the ground. But instead she focused on the heat radiating off Alena's sculpted arms, the feel of it against her own clammy flesh, and she acted as though the world was not on the verge of collapse. "Where do you want to begin?" She casually tossed the question over her shoulder. Step for step they rotated together in place, sizing up the task before them. They were in a grove in the Ulvenwald, but the Ulvenwald was not the woods they had known. Everything had become twisted and horrifying: the trees now had arms with long slender fingers that reached out to pull at Hal's hair, the brambles had mouths that blabbered and shrieked, the mosses had legs that carried them around like scampering rats, and now even the townsfolk, who did not belong here in the woods, had given in to the coercive force and become things that were far worse than the worst monsters Hal had ever known. "We should start with the townsfolk," Alena said. There were three, so mutated that their human forms were barely recognizable. "Come'mrakul. Be'mrakul." they called out. Hal felt the pull of their words. They had given in to the call the way Hal had been tempted to. They had crumpled and now they no longer had to fight it. Hal's ears rang and her insides crawled. It would be so easy. She could—no! Alena's steady heartbeat said "no." "I'll start with the jumpy one and you take the thick one." Alena's voice didn't hitch, not even once. Hal forced herself to ignore the constriction in her throat, the tightness in her head. "Sounds like a plan." She would try. She would fight. She grasped her blade and closed her mind to the garbled chanting. The thick one. She focused on the thick one—and then she gasped. "Alena. Alena, is that—" Hal couldn't finish. Alena peered over. "Elder Kolman. May the angel save him." Hal was gripped by vertigo, her vision dimmed. Impossible. "Are'mrakul." The abomination of the elder lurched forward. It was all Hal could do to brandish her sword and block his thick, branching arm. "Come'mrakul. Be'mrakul." Elder Kolman's words tumbled through Hal's spinning mind. How could this monster be the man she had once known? He swung at her with an arm that was like the trunk of a tree. Hal staggered back, her mind reeling. "Are'mrakul. Be'mrakul." The words wrapped round and round her, enveloping her. They told her not to think, not to worry, just to surrender. Be'mrakul. I'amrakul. "Hal?" Alena's voice. "Hal! His arm. Watch on the right!" Hal heard the words, but didn't make sense of them. Suddenly a flash of silver split through the Elder's thick arm. Alena's blade. Hal knew she should swing her sword too. But it was so heavy. It did not want to be swung. Be'mrakul. One'mrakul. She felt like she was floating. "Hal!" Alena sounded upset. But she was far away. So far away. It was Alena's touch, her sweating fingers gripping Hal's wrist, that yanked Hal away from the suffocating embrace. She looked up at the woman she loved. She didn't want Alena to be upset. She didn't want Alena to be so far away. And she didn't want Alena to be alone. She had to fight. It was hard. Harder than anything she had ever done. But she had to do it. She pushed the tightness out of her mind and found within herself the strength to lift her blade. "I'm all right, Alena," she said. "I'll be all right." "Of course you will." Hal felt the tension go out of Alena's body as Alena helped her to her feet. "Be'mrakul." The elder's jowls sputtered. Hal glared at him—no, that thing was not a him, it was not Elder Kolman. It was a monster. One that threated to tear Hal away from the staunch woman at her side. She would not allow it. "We should take him together, I think." Alena nodded at the monster. "Yes, I think that would be best." They stood side by side, shoulders pressed close. Alena inhaled. "On my mark." Hal didn't need Alena's mark to cue her; she felt the movement of Alena's muscles and hers responded instinctively. Together, they moved like a double-headed axe, lashing out on both sides but always connected in the middle. Alena sliced through the monster's left shoulder as Hal's blade chopped through its right. The squirming appendages landed on the ground at their feet, but the abomination didn't seem to notice. It lunged for them. "We'mrakul!" Hal swung again, beheading the once-holy man. Still he continued to chant, "I'amrakul, are'mrakul, Emrakul!" Hal couldn't bear to hear the words any longer. "Shut up!" She raised her blade and brought it down with such force that she cleaved the elder's head in two. A mass of latticed roots sprang out as though they had been packed inside too tightly all along. The chanting ceased. It was done. Hal reached out and Alena's hand was there. The immediacy with which their fingers intertwined told her that Alena would always be there. She silently made a promise to give the same in return. "We'mrakul." It was the voice of another of the townsfolk from behind. "Be'mrakul." Hal wanted to scream. And then she saw it. An opening, over the fallen elder's body, one that lead out of the grove of horrors. "Come!" She tugged on Alena's hand. "This way!" Alena followed Hal out through the reaching appendages and writhing masses. Out into the trees. Out where the air did not reek of rotten flesh. Out where the brambles remained rooted and the moss didn't skitter in sickening patches across the ground. They ran until they could no longer hear the chanting, until they could no longer feel the pressure in their heads. And then they ran farther, until their muscles gave way and their lungs screamed. They stopped at the edge of a bluff, collapsing into each other, forehead pressed to forehead, hands gripping shoulders, having breaths coalescing in the shrinking space between their lips. They would never surrender this; they would never let go. Instead, they had become. Her. One. One'mrakul. 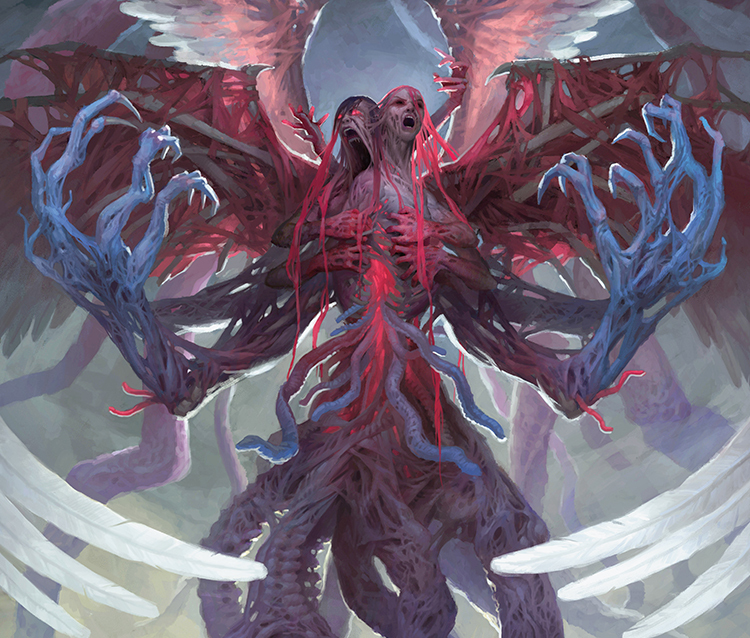 Emrakul's angel parted four wings, reached out with two arms, and cried with a single voice that sprang from two mouths, "We are Emrakul!" They were in Her image, the image of the everlasting truth, and their voice was Hers. "We are Emrakul!" Their call drew others. "We are'mrakul!" Voices rose up from the world below, melding into one sound, one truth. "One'mrakul, be'mrakul, we'mrakul!" It was glorious. It was everything. It was Her. Emrakul's angel led all below in following Her radiant form. What once was dark was now bathed in Her light, true light that was spreading farther and farther, a blossoming sunrise that would soon touch every corner of the world. "All are Emrakul! We are Emrakul!" We are Emrakul. All are Emrak— "Gah! No." Jace pushed the swirling words from his mind with a stern swipe. "And stay out." Tamiyo had taught him how to combat Emrakul's maddening touch, but maintaining the mental bulwark was more challenging than the moonfolk made it seem. That was a problem. A big problem for his plan. 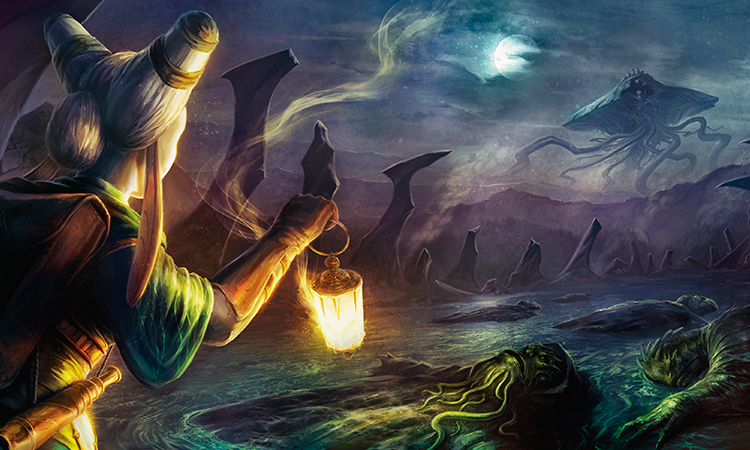 Every time he focused for too long on something other than the Eldrazi, Her tainted lattice would creep back into his head, corrupting his defenses and burrowing into the deepest recesses of his mind. This time it had been the sight of the warped angel in the sky overhead that had distracted Jace. He had done well at keeping his eyes on Tamiyo's back, keeping his focus on their trek across the rocks; he was following her toward what she called the nexus point. But the presence of the angel had been too much to ignore. So impossibly alien was its shape that Jace's curiosity had gotten the better of him. He'd glanced up and been drawn in instantly, having to work to parse what he was witnessing. At first he'd thought it a demon, but it was far worse than that. By the time he had resolved the multiple wings, the lattice-like connective tissue between the dual heads, the melding echoing voice, he had lost himself. That was unacceptable. He needed to be able to trust his mind for what he was about to do. Was he really about to do it? Could he actually justify bringing the rest of them here, to be set upon by this madness? The question dropped to the pit of his stomach and swelled up into a wave of nausea. He had thought it was the right thing. Hadn't he? Yes, he had come to it as the only solution. He was certain—almost certain. Close to certain. "Gah!" Jace threw up his arms. "Shh!" Tamiyo shot a scolding glance over her shoulder. "Sorry." Jace held up his hands defensively. Tamiyo glowered but turned back to the path, to her magical lantern and her soft footfalls. He should tell her. Tell her to wait here and he would bring help. This was bigger than something the two of them could handle alone. In truth, it always had been, even when Jace thought it was just the mad angel, Avacyn. If it hadn't been for Sorin back at the cathedral—Sorin. 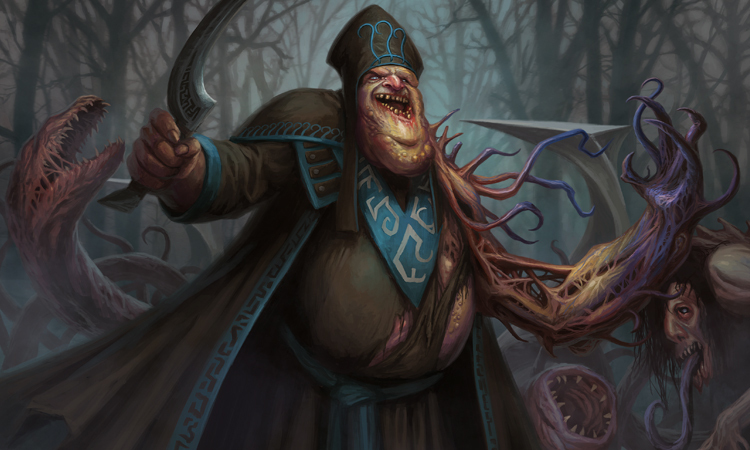 Jace cursed the ancient vampire who had brought Innistrad to the brink of destruction and then just merely drifted away, leaving the mess for Jace to clean up. But an Eldrazi titan wasn't something he could clean up alone. It was never meant to be something he had to do alone. Gideon himself had told Jace to come back to Zendikar if he heard news of the titan. Well, Jace had done better than that; he had found Her. Gideon should be quite pleased. Ahead, Tamiyo paused at the shore and held her lantern aloft. Jace followed the tendrils of magically enhanced light, lifting his eyes to the sky. As soon as he did, he wished he hadn't. It was the first time he had actually seen Her: the titan, Emrakul. 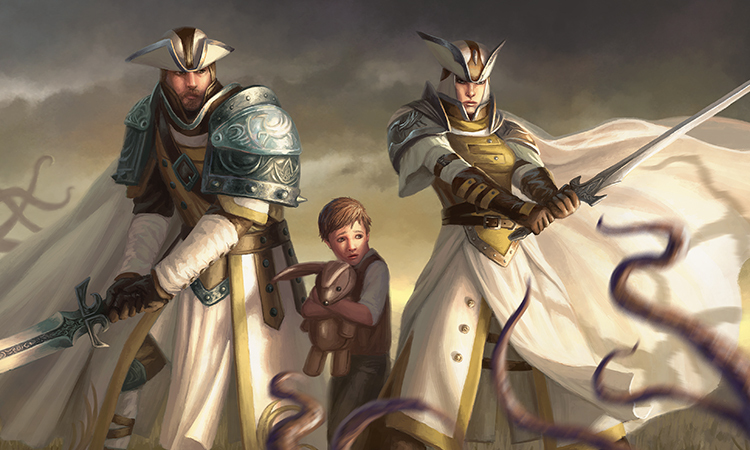 Emrakul was bigger, he could swear, than either of the others. And, in her way, far, far more powerful. She had only been on this world for a short time, and already so much of it seemed to belong to her. All of Innistrad had uprooted itself to follow her. Cultists, warped into her likeness, dragged themselves over the rocks, abandoning all that they had been in their former lives. Animals and monsters alike, on the land, in the sky, and in the sea flocked behind her as she went. The trees, mosses, and brambles, even the algae trailed itself from the water to be closer to her warping presence. Jace, too, felt the urge to go to Her. I'amrakul. He wanted to shake himself. He had to clear his mind. He had to think. He couldn't let Her have what She wanted. He once again mimicked what Tamiyo had taught him, clenching his hands into fists with the effort. The process of ensuring that there was no residue of delirium was not unlike clearing away cobwebs from inside one's head. 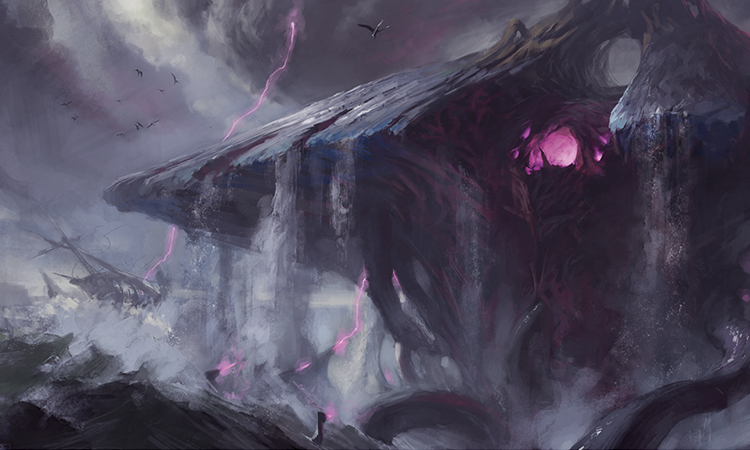 Thick, lattice-like cobwebs exuded by a towering Eldrazi monstrosity hell-bent on consuming the mind of every living thing on this world. Jace shuddered. This is what he would have to be able to do for them, for Gideon and Chandra and Nissa. He'd have to protect their minds along with his own. He couldn't bring them here and then leave them to be consumed by Her. He wouldn't. So then the question was: Could he do it? He had asked himself this very thing what felt like a hundred times, and yet he didn't have the answer. "You say they call Her Emrakul?" Tamiyo's curious voice drew Jace out of his thoughts. He glanced at her; her face was a study in serenity, as though holding her mind against the madness was no more difficult than breathing. "Yes," Jace said. "That's one of the things they call Her." "Fascinating that such a thing should have a name." Tamiyo lifted her telescope from her belt and placed it to her eye. "I wonder if that is what She calls Herself." Jace had never paused to ask that question. He would have never thought it something worth asking; the moonfolk saw things much differently than he did. He stared ahead at Emrakul's massive form, trying to see Her the way Tamiyo did. He looked into Her enormous magenta eye. It was warm and welcoming. He wondered what he would find if he went inside. He held himself back, just on the precipice. What is your name? he asked What do you call yourself? The enteral infinity—this world is mine. The absolute—I shall have all. The beginning—I shall be all. Jace pulled back, gasping for breath. This was not the end. This would not be the end. Not for him, and not for Innistrad. He had to stop doubting, stop procrastinating; he had to trust his mind. He glanced again at the serene Tamiyo; if she could do it, he could do it, he could do it for them. Yes. It was time to bring the Gatewatch to Innistrad. He cleared his throat. "Tamiyo, I have to go." "What?" Tamiyo turned, her lavender eyes wide. "There are three others. Planeswalkers. They're powerful, they're the best there are, and they can help. I have to go get them. On another world, we killed two more like that." He nodded at Emrakul without actually looking at Her. Tamiyo appeared reluctant to believe him. "Two?" "It took all of us, but yes." Tamiyo cocked her head and squinted into his eyes. Jace had the urge to look away—he felt guilty under her scrutiny, though he wasn't sure why. And then suddenly she smiled. "You did. Yes, you really and truly did. My, now that's a story I'll have to hear." She sighed. "But another time. If this world's story hopes for an ending other than darkness, we must each do our part." "No, Jace. That's not my path." "Will you be here when we come back?" "We will all be where we must be." Jace opened his mouth to argue, but then he felt a calming touch on his mind. Tamiyo. He no longer had to fight to hold onto his sanity; he hadn't even realized that he had been straining so hard. It was like a terrible headache had finally broken. Relief. He relaxed into it. "I will protect your mind so you can planeswalk," Tamiyo said. "Go." "Well, look who decided to show up. Hey, Gideon, over here!" "About time!" The tromping of boots materialized in Jace's ears, and the afterimage of Emrakul looming above gave way to the smiling face of his friend.